Product #16501 | SKU MC1990A | 0.0 (no ratings yet) Thanks for your rating! 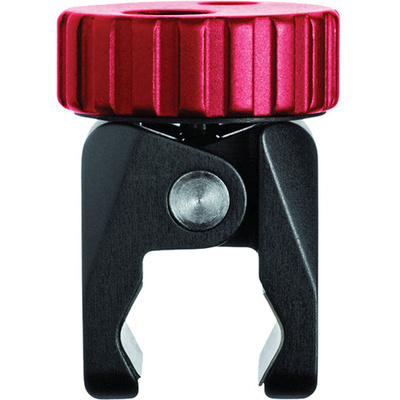 The Pico Clamp from Manfrotto is a small yet versatile clamp that can attach to thin bars with a diameter between 8 and 15mm. The clamp has two threaded holes on it, one is 1/4"-20, the other is 3/8"-16. It can hold gear such as speedlights, cameras, LED lights, audio recorders, or other gear weighing 2 kg or less. You simply screw the included adapter into your gear's threaded mount, and then screw the Pico Clamp onto the other end of the adapter. Tighten the clamp's red knob to close it down for easy attachment.